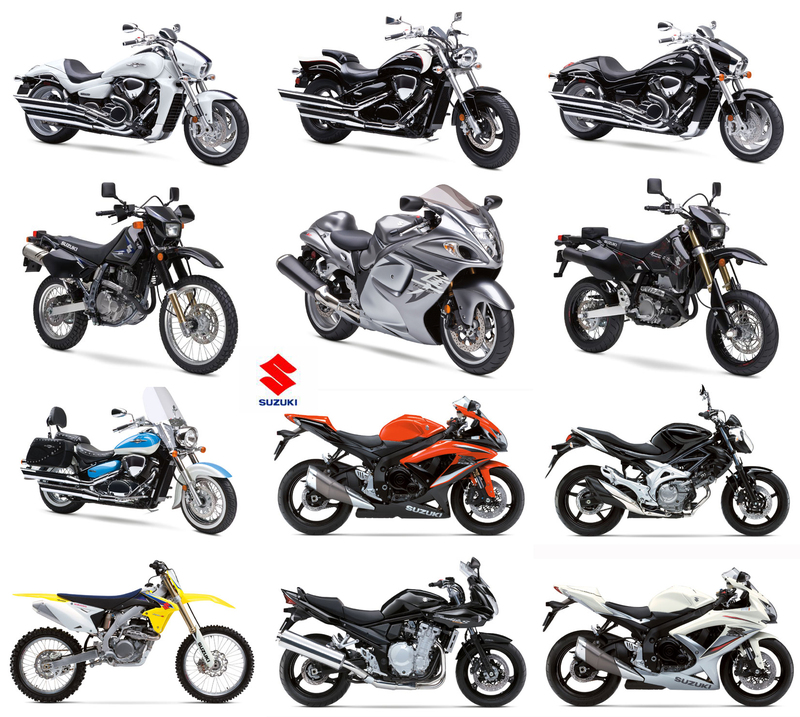 Tachyon, Inc. has developed a way for motorcycle video enthusiasts to get nearly unlimited recording time while riding. 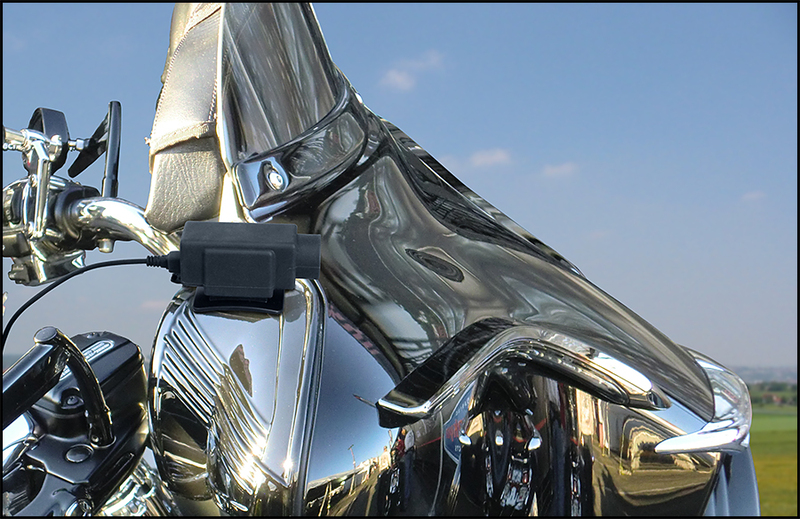 With the BikerCam’s 12V Charge n’ Record Charger connecting the camera to the bike, the camera will receive continuous power that will charge the BikerCam while it is recording. Other motorcycle cameras currently on the market offer a battery life of only 1 to 2 hours of recording time. This forces riders to either stop often to recharge, or to accept missing recording most of the ride. But the BikerCam, connected to the 12V Charge n’ Record Charger, wires directly to the bike’s 12V socket for unlimited power. Other cameras will also face the problem of a full memory card. But the BikerCam is equipped with looped-recording technology that begins recording over the oldest files once the card is full. A 64GB memory card (sold separately) will give the rider over 17 hours of video before the card is full. This enables the rider to focus on riding and to forget the camera, only downloading files when necessary to save something special. When removed from the handlebar mount and unplugged from the charger, the fully charged camera can also be used to record videos away from the bike, for another 4.5 hours. BikerCam utilizes a wide-angle lens that captures more of the road and other vehicles, without the undesired fish-eye effect, produced by other cameras. It is the perfect camera for those long road trips and for recording the beautiful scenery and winding roads. Record all of the rallies, not just the highlights. Record the whole trip to Sturgis on one card, or get all the action at Daytona Beach without taking time out to recharge the camera. And with the video time stamp, the time and date will appear on the video, for future reference. 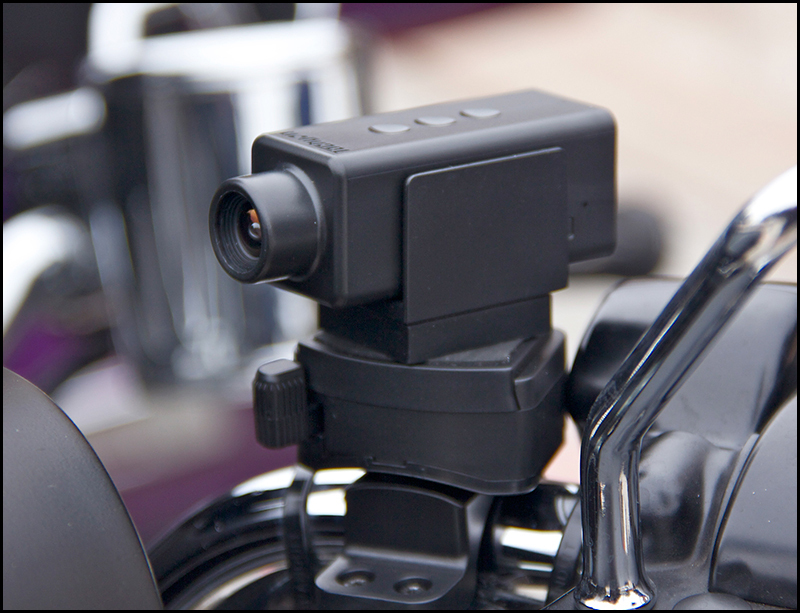 BikerCam, with its contour mount, will easily mount to helmets or fenders. And when attached to its Quick-Release Handlebar Mount, can also mount to the motorcycle’s handlebars, engine guards, sissy bars, or racks. The Quick-Release Handlebar Mount is designed to remain securely attached to the bike, while the camera can be easily removed from the mount at any time. Once removed from the bike, the camera can be used as a dash cam in a car, a security camera at home, and much more. 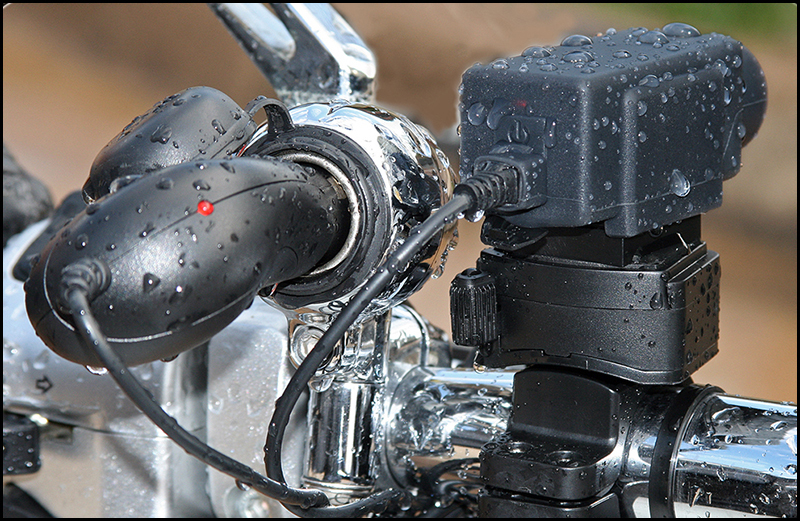 Included with each BikerCam is a Rainproof Cover which will protect it from rain, dust, and flying stones. Charging and mounting the camera are unaffected when using the cover. BikerCam is also capable of taking time-lapse photos. One photo will be taken every two seconds. Each photo is time and date stamped, which is extremely useful when there is a need for documenting unsafe drivers or accidents. Like all Tachyon cameras, the BikerCam could not be easier to use. It is ready to go right out of the box and its simple, one-button operation eliminates any confusion for its users. The cameras are also capable of plug-and-play on a PC or a Mac. The BikerCam only weighs 1.7 oz and boasts the patented 8-way mounting system which allows for an unparalleled range of mounting positions, allowing the user to rotate the camera through the 12, 9, 6, and 3 o’clock positions, as well as forwards or backwards. And this can all be accomplished very easily while the BikerCam rests in the mount. BikerCam makes use of a built-in lithium rechargeable battery, which is ideal for riding in the cold, or shooting other action sports such as snowmobiling or snowboarding. This internal battery, tightly enclosed within the case, is designed to prevent loss of footage due to shock when engaging in extreme activities. Standard mounts for the BikerCam are the Contour Mount, for mounting to curved surfaces such as the side or tops of helmets or fenders, a standard Tripod Mount that will attach to any ¼-20 inch universal tripod screw, and a Clip Mount with multiple angles of rotation making it perfect for caps, collars, straps, and do-rags. Gun owners may also want to check out the Tachyon, Inc. Picatinny Rail Mount and GunCam® accessories. The BikerCam System, which includes the camera, the Contour, Tripod, and Clip Mounts, the 12V Charge n’ Record Charger, and the Quick-Release Handlebar Mount, can be purchased for only $189.99 from the Tachyon website. 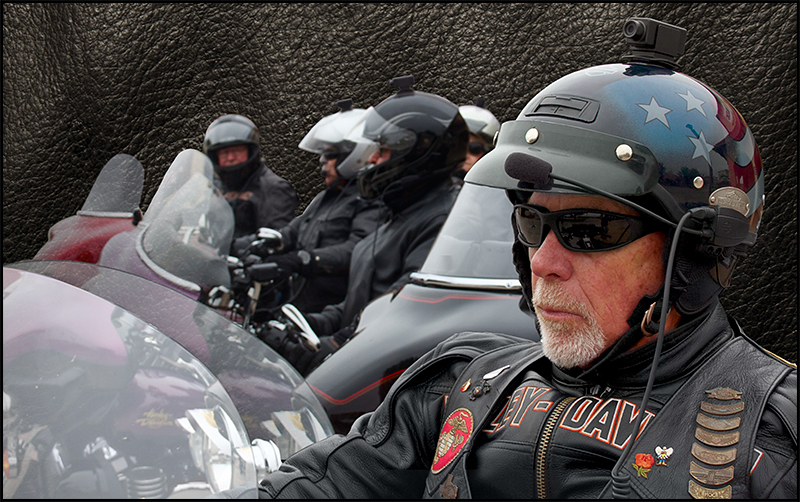 Lewisville, TX based Tachyon Inc., is the premier innovator of durable, extreme helmet cameras. The Tachyon camera’s ease-of-use, durability, recording time and quality, make Tachyon the trusted and go-to helmet camera source for people who engage in a wide-range of extreme activities. Tachyon®, GunCam®, and BikerCam™ are registered trademarks of Tachyon, Inc.